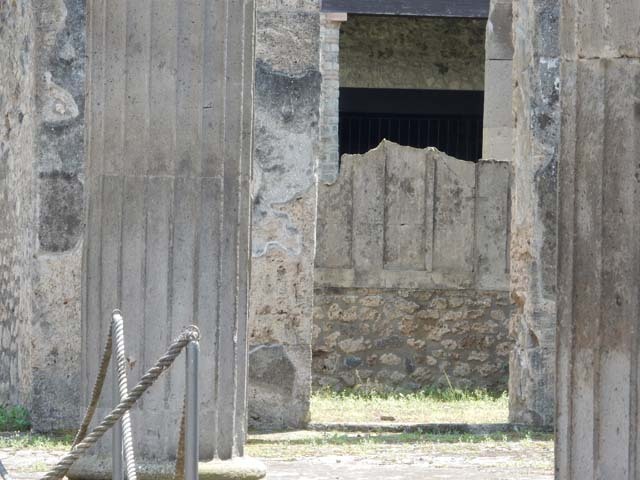 IX.14.4 Pompeii. May 2017. 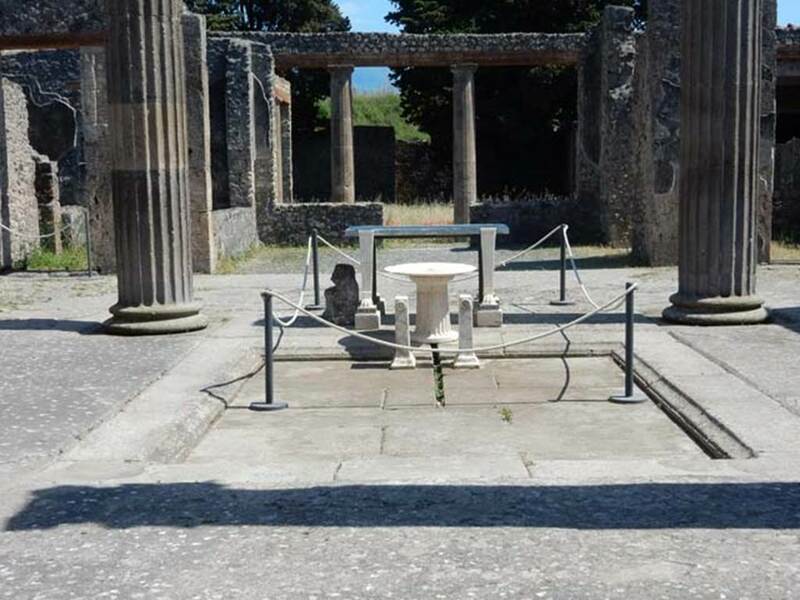 Looking south across impluvium in atrium B towards tablinum H.
IX.14.4 Pompeii. May 2005. Looking south across impluvium in atrium B towards tablinum H.
When discovered, the walls of the tablinum where covered with rough plaster, awaiting their coating of fine decoration. Found fixed on the south side of the atrium, on the side pilasters of the tablinum, were four figured bronze fittings, of two different types, (borchia figurata). The holes left by the removal of the four figured bronze fittings can be seen on each pillar of the tablinum entrance. See Notizie degli Scavi di Antichità, 1905, (p. 253-256). 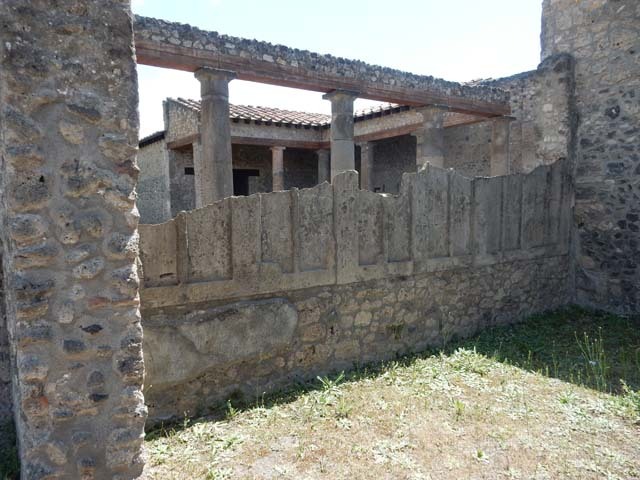 IX.14.4 Pompeii. 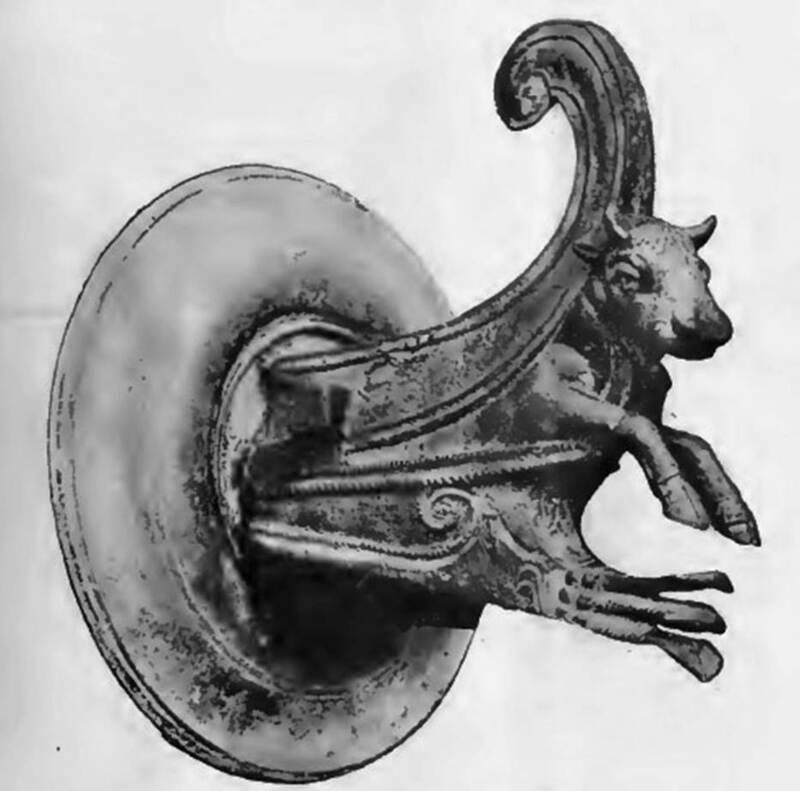 Bronze fittings, (borchia figurata) in the style of prows of a warship with a figure of a bull. A rostrum of a warship, used to ram enemy ships, is seen below the bull. SAP inventory 3211a and 3211b. 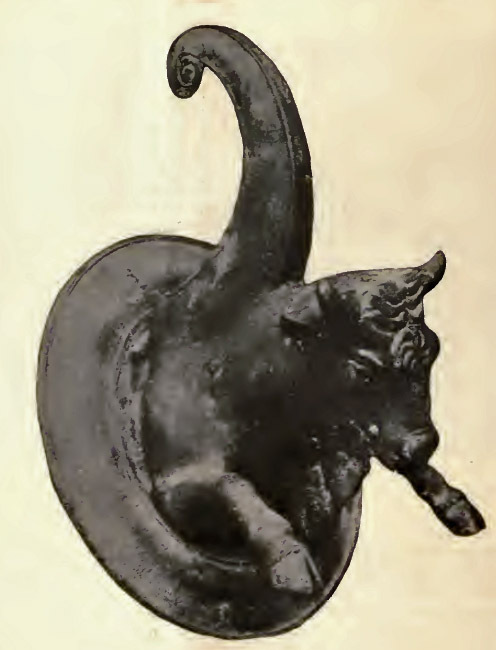 One of a pair of bronze fittings (borchia figurata), from south wall of atrium B. 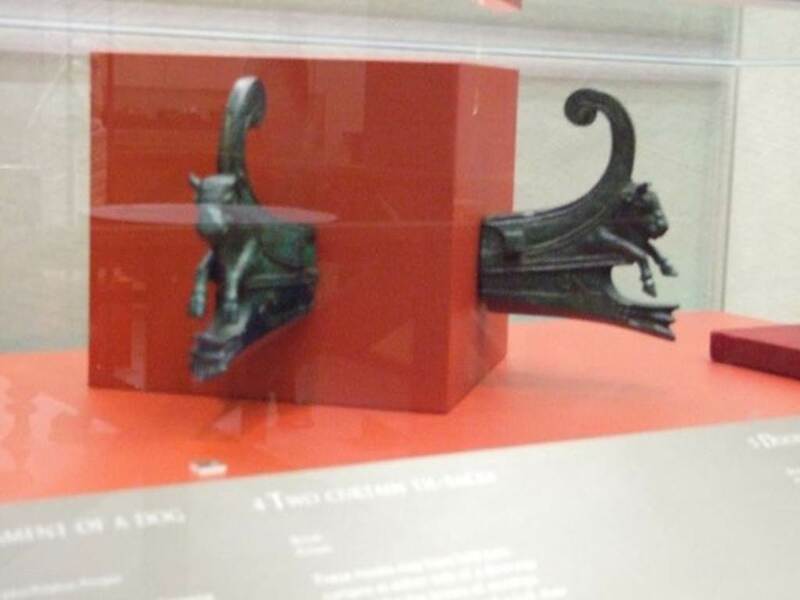 One of another pair of bronze fitting (borchia figurata), from south wall of atrium B. Looking south from the atrium at corridor I on the east of the tablinum H and through the tablinum towards the peristyle 1. 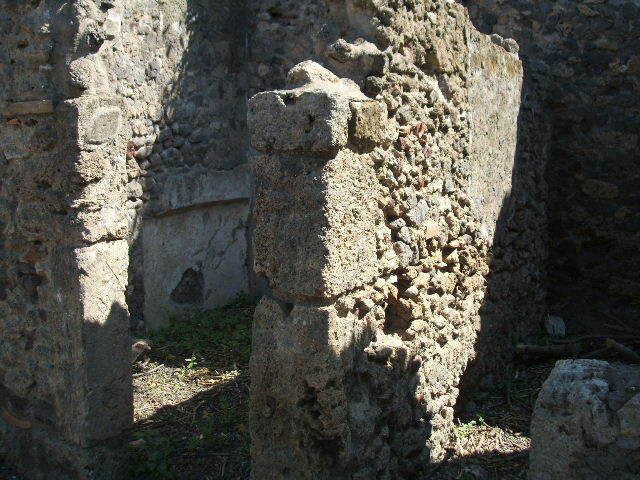 The holes left by the removal of the two of the four figured bronze fittings can be seen on the pillar, left of centre. 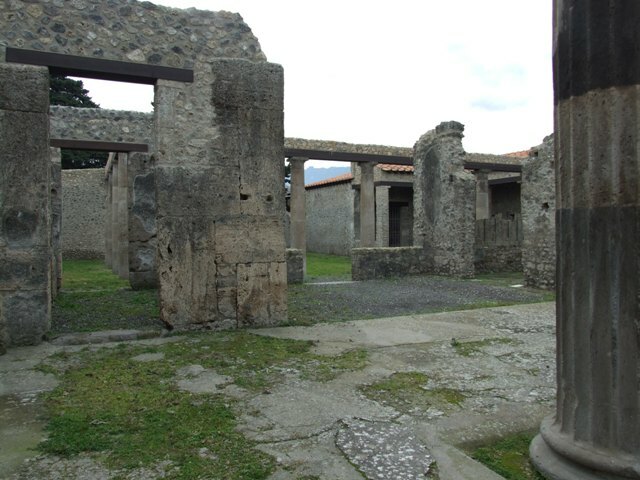 IX.14.4 Pompeii. May 2017. Rooms K and L on the east side of the corridor on the east of the tablinum. IX.14.4 Pompeii. May 2005. Rooms K and L on the east side of the corridor on the east of the tablinum. 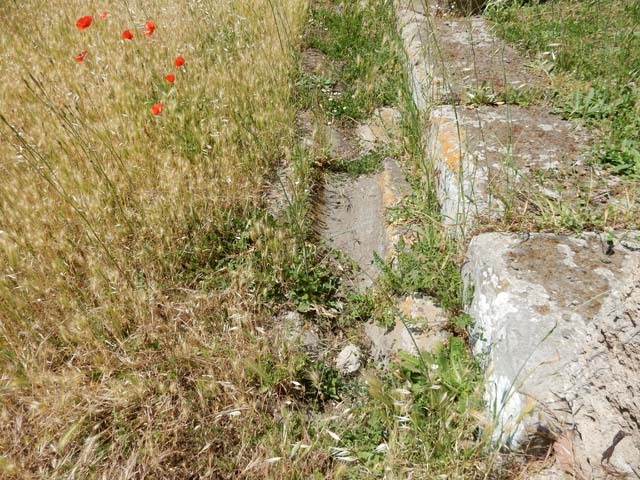 According to Sogliano, room K on the left was a cubiculum. 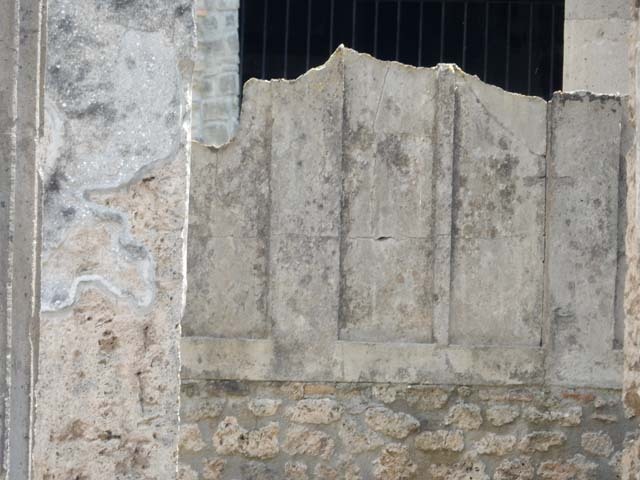 The walls were decorated with white plaster, divided into large panels, but of this decoration nothing much remained. 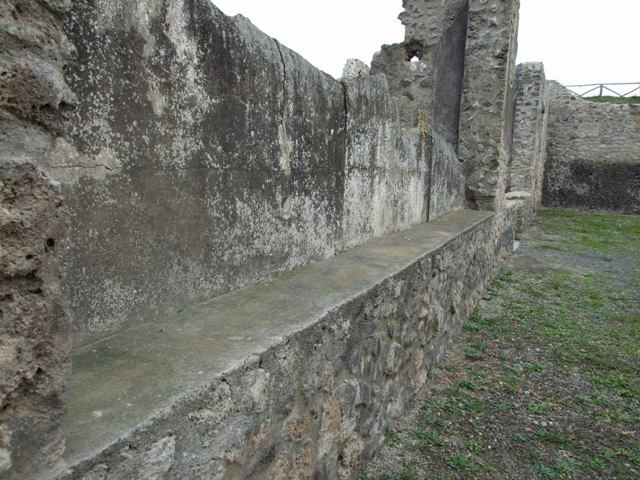 The recess for the bed can be seen in the north wall. The east part where the bed would have been had a low ceiling, the west part (the nearest end) would have had a barrel-vaulted ceiling, traces of which could still be seen then. In the north and south walls, the holes for the beam supports of an upper room could be seen. 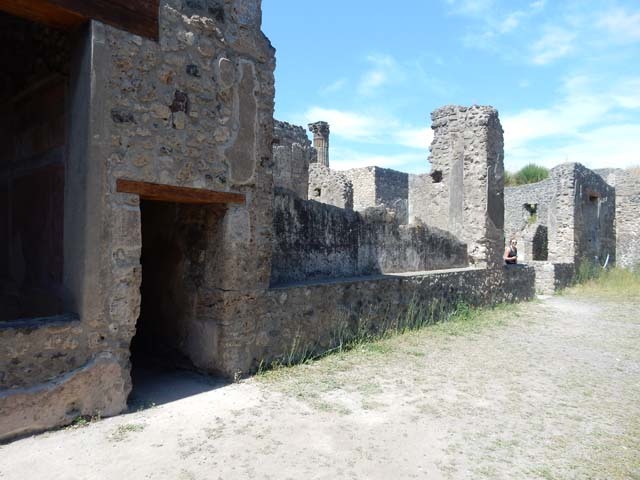 Room L on the right was the site of a wooden staircase to the upper floor, traces of which could be seen against the south wall. See Notizie degli Scavi di Antichità, 1905, p. 256-7). IX.14.4 Pompeii. May 2017. Rooms K and L on the east side of the corridor, east walls with windows. IX.14.4 Pompeii. May 2017. Looking north-west towards atrium, from room I. Photo courtesy of Buzz Ferebee. 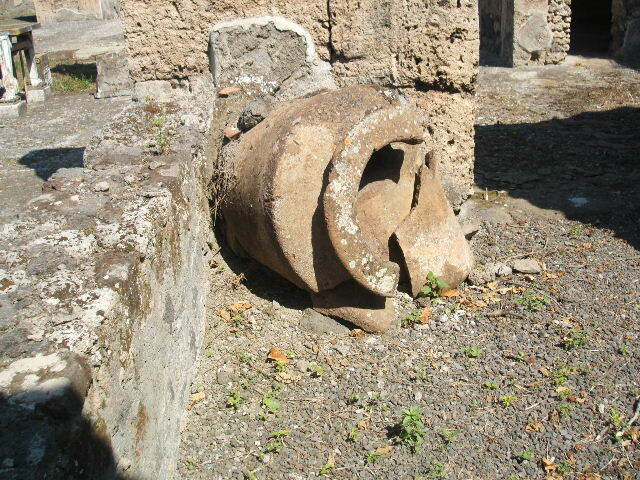 IX.14.4 Pompeii. May 2005. 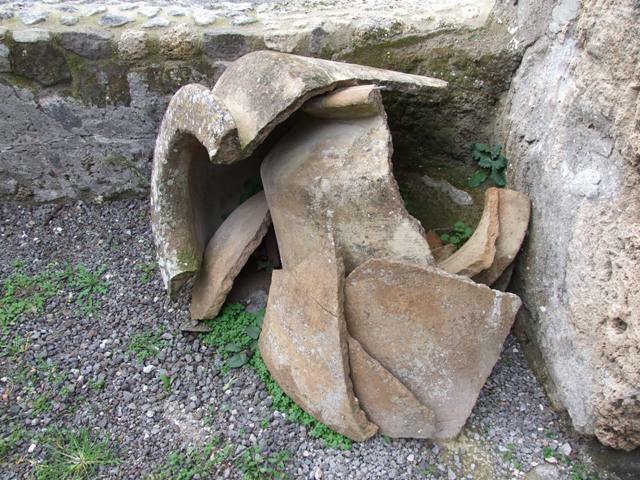 Broken terracotta pot in corridor I to east of tablinum. IX.14.4 Pompeii. December 2007. Broken terracotta pot in corridor I to east of tablinum. 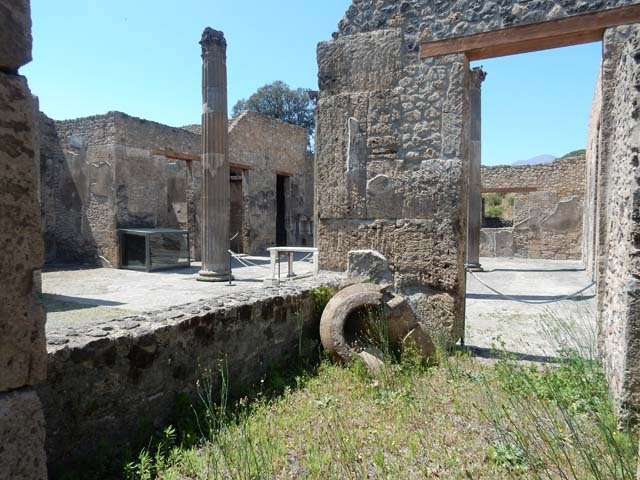 IX.14.4 Pompeii. May2017. Peristyle 1, looking south-west across north portico towards room 3 and room 5. IX.14.4 Pompeii. May 2017. Peristyle gutter. Photo courtesy of Buzz Ferebee. 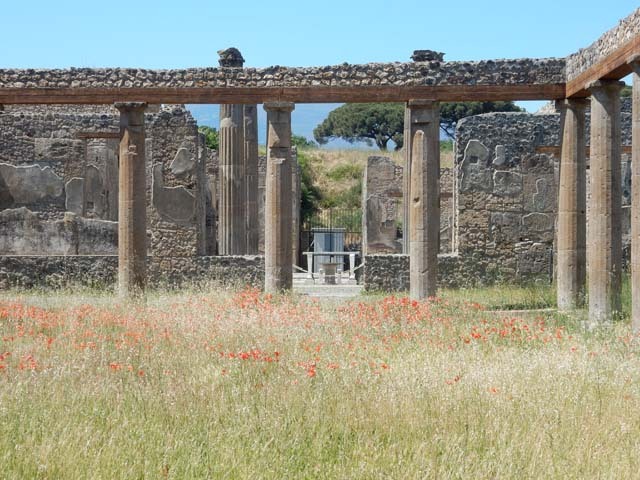 IX.14.4 Pompeii. December 2007. Peristyle 1, looking across north portico to rooms 3 (on left), 5, staircase (m), 12, 13, 14 and 15. IX.14.4 Pompeii. May 2017. Looking across peristyle towards north portico, and doorway to tablinum and atrium. IX.14.4 Pompeii. May 2017. 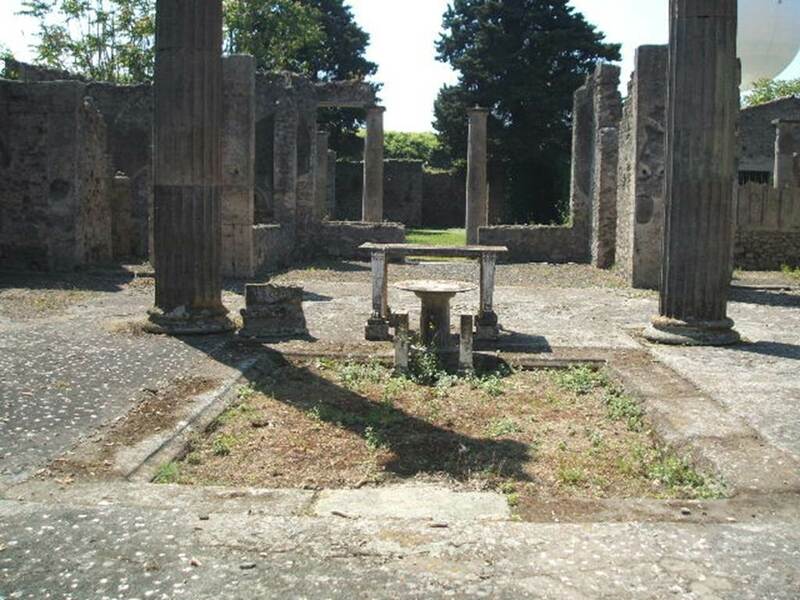 Looking north-east across peristyle towards north portico, and doorway to tablinum and atrium. 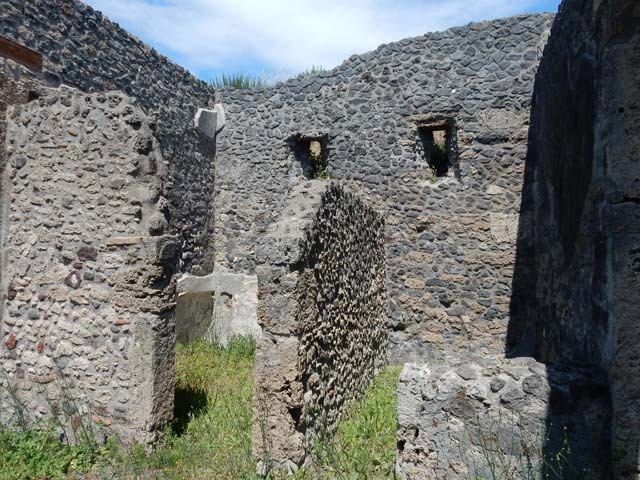 IX.14.4 Pompeii. May 2017. Looking north-east along north portico, Photo courtesy of Buzz Ferebee. IX.14.4 Pompeii. December 2007. Rear wall of large room 24 on north side of the peristyle 1. Looking east along the parapet wall with plaster cast (p) of wooden shutters. The excavation of the north portico has led today to the unveiling of another interesting novelty. The great room, (numbered 24) west of the tablinum, like the tablinum, protrudes into the portico with a parapet at a height of 0.95 m.
Above the parapet the wall was closed by a series of wooden shutters in rectangular frames, containing more slender panes. The shutters were held together by hinges, and perhaps fixed with bolts into the massive wooden sill that ran along the parapet. All of this came out crystal clear in the casts made in the ash, for now only for about 1m at the eastern end. 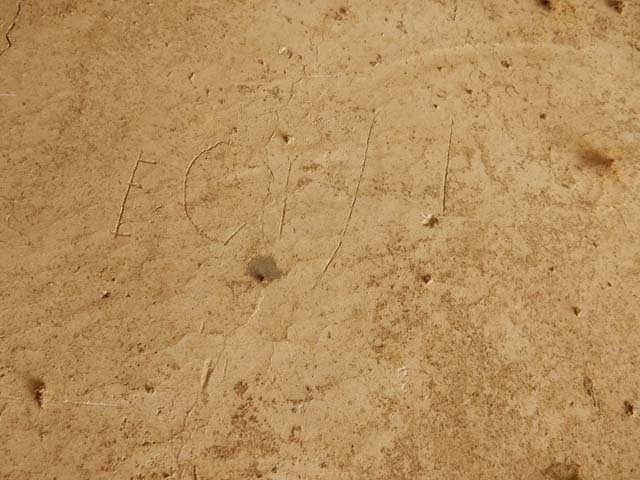 It is clear that the whole space, approx 6 m wide, will repeat a similar feature and a substantial footprint can thus be obtained in plaster. See Notizie degli Scavi di Antichità, 1911, (p. 51-2). According to NdS for May 1911, a plaster cast was made of the lower third of the characteristic closure which protected the south side of room 24, in the manner of a window with doorjambs and windowsill of wood. The plaster cast would be left in situ, protected in the best possible way, to make the visits to the house even more interesting for visitors. 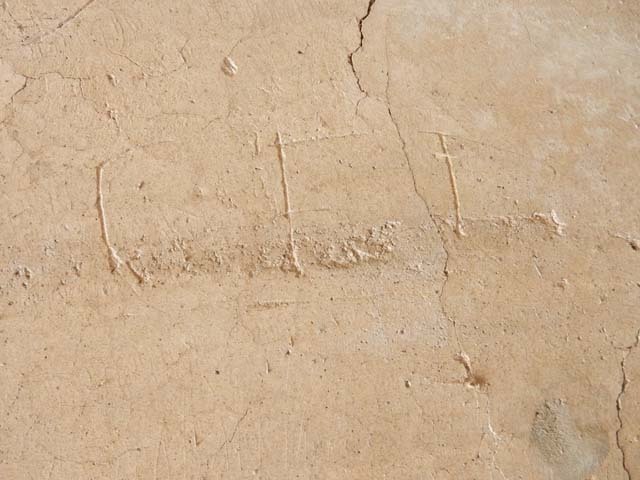 The plaster cast was indicated by “p” on the plan. Room 24, looking south-west towards the side of the parapet wall showing the plaster-cast of the wooden shutters. Looking south towards the side of the parapet wall showing the plaster-cast of the wooden shutters, in the large room numbered 24. IX.14.4 Pompeii. May 2015. Room 24, detail of plaster-cast of wooden shutters. Photo courtesy of Buzz Ferebee. 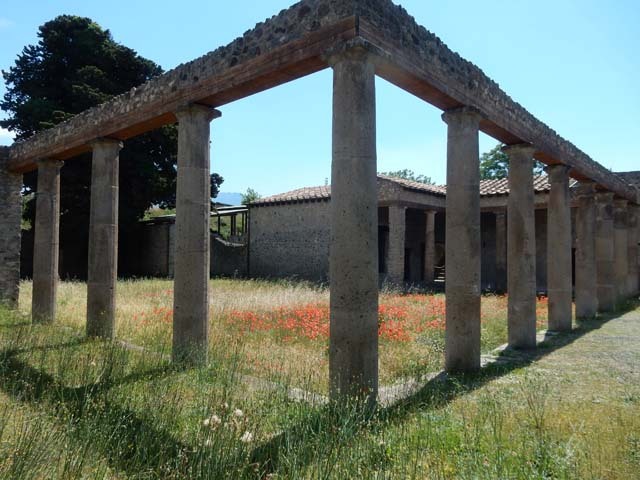 IX.14.4 Pompeii. December 2007. 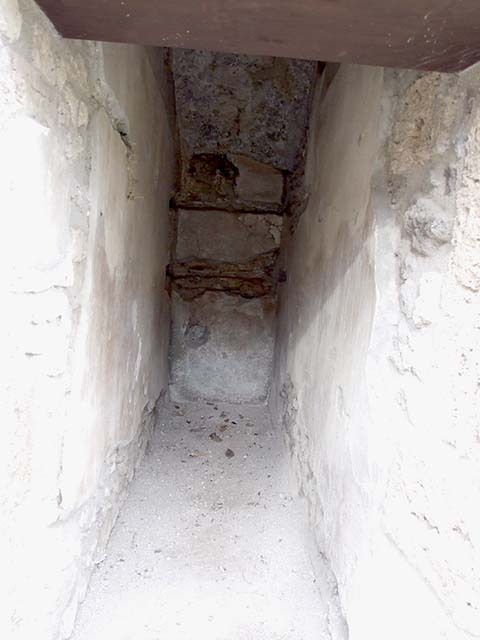 Area on north side of peristyle between rooms 19 and 24. This is under the staircase on south-east side of secondary atrium at IX.14.2. IX.14.4 Pompeii. 1911. 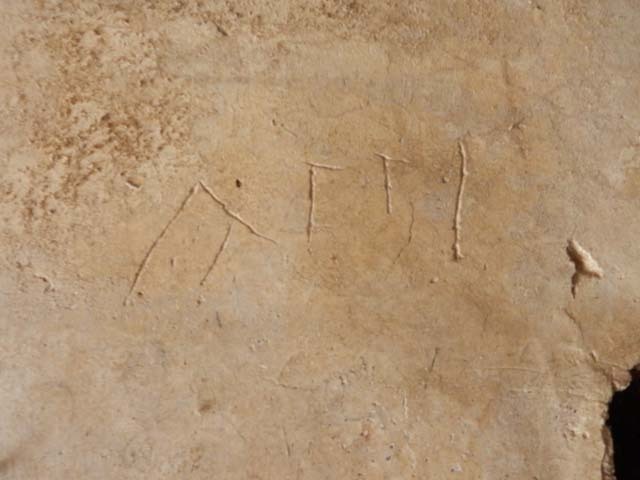 NdS recorded these graffiti as being under the stairs. See Notizie degli Scavi di Antichità, 1911, page 220. 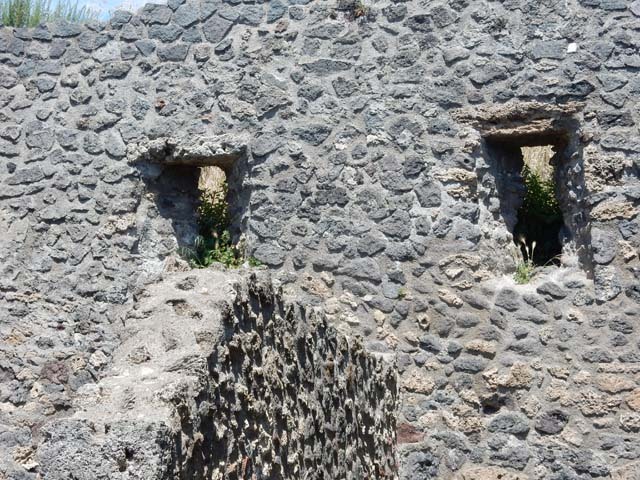 IX.14.4 Pompeii. May 2017. Graffito under the staircase on north side of peristyle. 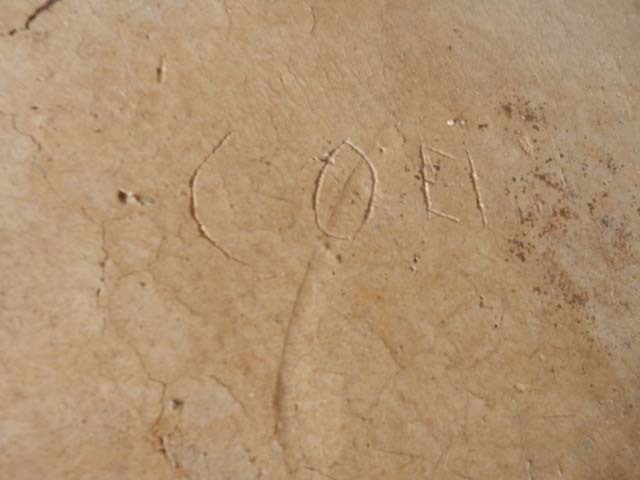 This reads Ecisi. 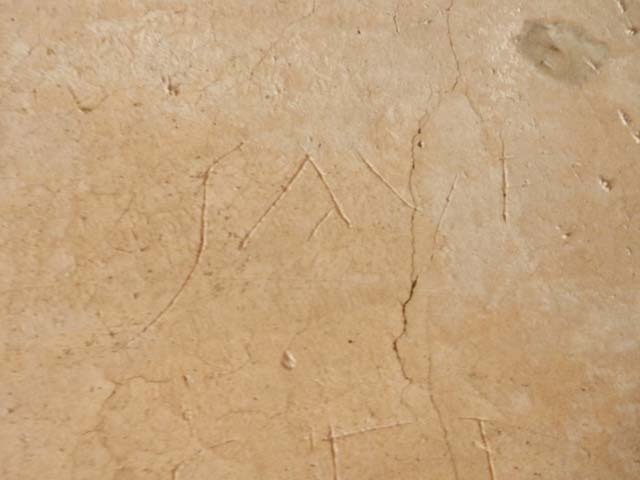 IX.14.4 Pompeii. May 2017. Graffiti under the staircase on north side of peristyle. These read Sauf(ei) and Cei. IX.14.4 Pompeii. May 2017. Graffito under the staircase on north side of peristyle. This reads Cei. IX.14.4 Pompeii. May 2017. Graffito under the staircase on north side of peristyle. 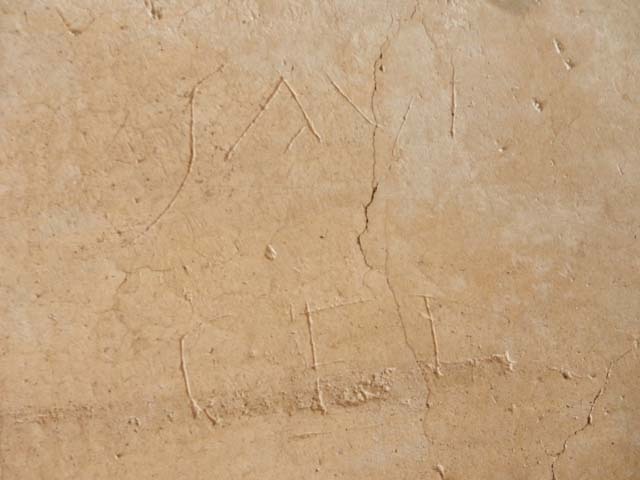 This reads Sauf(ei). IX.14.4 Pompeii. May 2017. Graffito under the staircase on north side of peristyle. This reads Coei. IX.14.4 Pompeii. May 2017. Graffito under the staircase on north side of peristyle. This reads Atti. 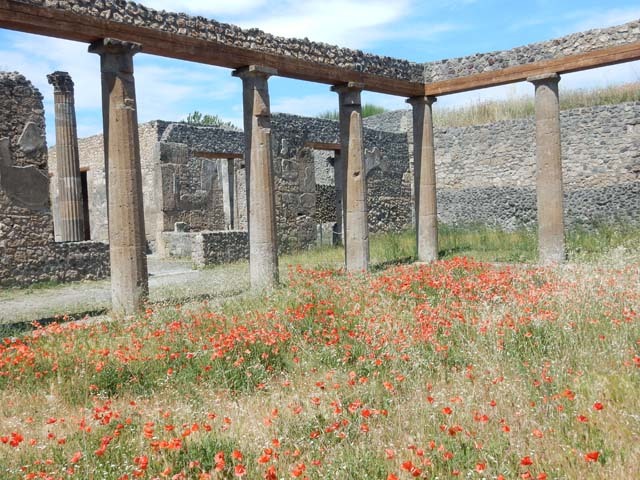 IX.14.4 Pompeii. May 2017. Graffito under the staircase on north side of peristyle. This reads Alfi. IX.14.4 Pompeii. December 2007. Graffito under the staircase on north side of peristyle. 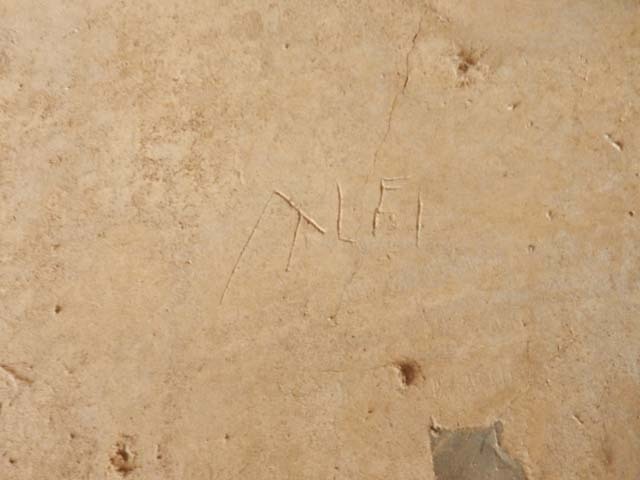 There are two graffiti which appear to be Valeri and below it Alfi. 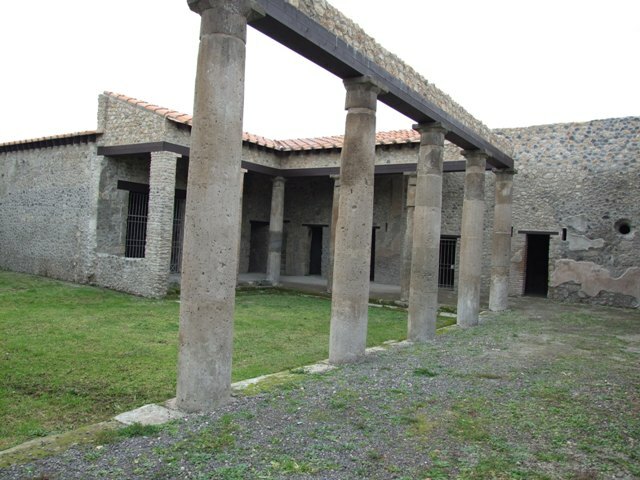 IX.14.4 Pompeii. May 2017. 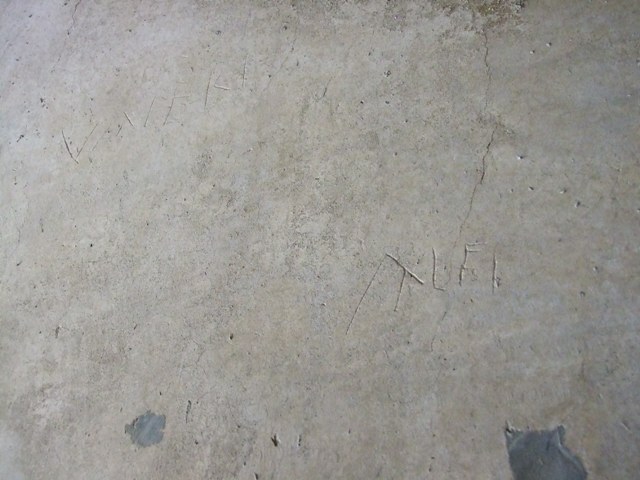 Graffito under the staircase on north side of peristyle. 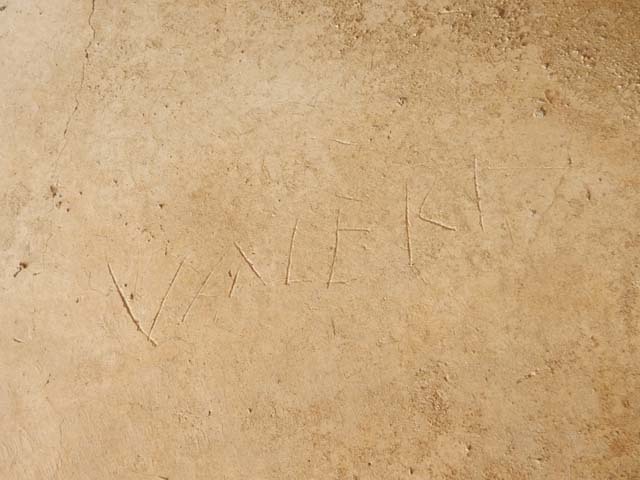 This reads Valeri.